"Choir Boys" is a episode from season six. 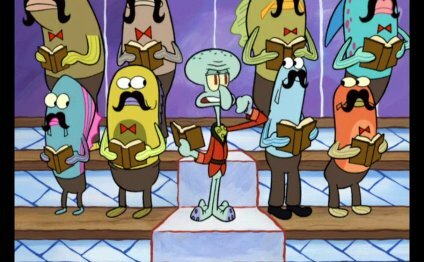 In this episode, SpongeBob wants to join the choir that Squidward participates in. Squidward takes a shower and gets dressed, and prepares to audition for open chair at the Bikini Bottom Men's Chorus. When he steps outside, SpongeBob is lying on the ground, depressed. SpongeBob tells him that the reason he is so sad is that Patrick is out of town for a family reunion, and he needs someone to play with and something to do until Patrick gets back. SpongeBob asks Squidward where he is going, and asks Squidward if he can come with him. Squidward says no. SpongeBob tries to show Squidward he can sing, but Squidward rides off, leaving him in the dust. SpongeBob digs a pothole, and when Squidward falls into it, he tumbles into Jellyfish Fields, where a swarm of jellyfish surround and sting him as SpongeBob takes advantage of his "captive audience." Later, Squidward is back to riding his recumbent bicycle. When he sees he is almost late, he takes a detour through grass, where he is stopped by SpongeBob, who is dressed as a policeman. He gives Squidward a ticket for "reckless frowning" and not listening to him sing. Squidward rips off his mustache, yells at him, ties him to coral with some kelp, and rides off. When Squidward sings "figaro, "
SpongeBob also sings, generating sound waves which cause the kelp to fall apart and attract jellyfish, which carry him away. Meanwhile, Squidward arrives in time and takes his place. After spending a considerable amount of time clearing his throat, the music begins and he sings along, quite poorly. SpongeBob, carried by jellyfish, comes in, singing. The people find his voice beautiful and give him the open chair, as well as a mustache which he wears. SpongeBob accepts, but only if they find a spot for his "inspiration and great friend, " Squidward. They agree. During the concert, SpongeBob sings. Squidward is in charge of turning the pages of his songbook, which he does with a bitter look on his face.